Not many know that the legendary actor Sivaji Ganesan was a rakhi brother to both Lata Mangeshkar and Asha Bhosle, and their families have long shared a close relationship. In the 1950s, Sivaji Productions produced only Hindi movies. Both Lata Mangeshkar and Asha Bhosle had sung for the films, but had never met my father, Sivaji Ganesan. When Ashaji was in Chennai, she happened to watch the Tamil film, Paava Mannippu. When she returned to Mumbai, she told her family that they had to see a Tamil actor called Sivaji Ganesan. So they watched Paava Mannippu at the Aurora theatre (in King's Circle, north-central Mumbai). It was the first Tamil film that they had seen. During the interval, they realised all of them were crying even though no one understood a word of Tamil. All of them felt he (Sivaji Ganesan) reminded them of their father Dinanath Mangeshkar. The next day, they contacted my father through HMV (the music label) and flew to Chennai to meet him. They came home, hugged him, tied rakhis and started crying. From the first meeting itself, everything clicked and the friendship that started almost 50 years ago continues till today. They used to call my parents Anna and Anni. My father may be no more, but I have continued the relationship. I must have met them when I was six or seven years old, but I remember meeting them in the late 1960s when I was about 13. They attended my sister's wedding in 1968, but I was away then in a boarding school in Bangalore.I got to know them well only in the 1970s when I returned to Chennai after my schooling. My first memory of Ashaji was that of a fun loving person. Lataji is more reserved. Over the years, Lataji started speaking to me more than she spoke to my parents. I now share a very close relationship with them. I call Ashaji Mummy or Maaji. Lataji is the universal Didi. We shot Trishulam in Mumbai. They would visit my father on the sets. In the evenings, after the shooting, my parents would go to Peddar Road (in south Mumbai) to spend time with them. 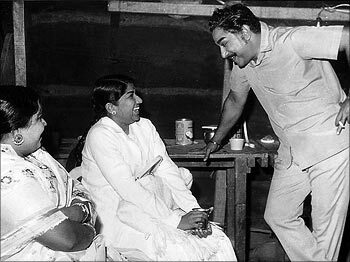 The funny thing about my father and the Mangeshkar sisters was that they spoke to him in Hindi and Marathi and he would speak in his broken Hindi. My father had a great sense of humour. I have seen them enjoying each other's company, laughing and talking. My mother didn't know English or Hindi. Yet, we would see Lataji and Ashaji talking to her for hours -- my mother in Tamil and they in Hindi. They were very close. They would shop together and spend a lot of time together. They used to come and stay with us often. I have heard a story that happened in 1960-1961. In those days, my father used to hunt. Somebody had sent some cuckoos to my father, as they are supposed to be a delicacy. When Lataji got up in the morning, she heard the cuckoos singing. When she asked about the birds, somebody told her that they had been brought for her to eat. She got so upset, she started crying. She opened the cage and let them fly away. My mother and grandmother watched quietly. When my father woke up, she told him, 'Anna, I am called the Nightingale of India, how can you, my brother, do this? Don't ever eat them.' My father never ate bird meat after that. I'll tell you another incident that my father told us. Once the radio was playing P Susheela's song, Athan Ennathan. My father asked if they could sing like that. Lataji kept quiet. After six months when he went to Mumbai, Lataji asked him to come home as she had something important to say. When he reached her house, both sisters started singing Anthan Ennathan. Lataji said since my father had asked them if they could sing as well as P Susheela, they sang the song in Tamil. They consider P Susheela one of the greatest singers in India. They have always had high regard for our (south Indian) singers. They used to have a high opinion of Ilayaraja. Now, they are great fans of A R Rahman. Now that my parents are no longer here, I look up to them as my closest people. I tell them that they are my father and mother. I am close to both of them -- closer to them than I was with my parents. The way they call Ramu in their sweet soft voice, it is like God calling you. I have lunch with them quite often and the three sisters (including Usha Mangeshkar) treat me like their nephew. Ashaji loves cooking for me, as I love food. The food that they make is delicious, especially their biryanis. Ashaji is an excellent cook. Whenever I visit her, she tries new recipes on me. They are foodies like us. I discuss everything with them. Ashaji used to say that I would become an actor. But I didn't, my younger brother Prabhu did. Even now, she says, I should have been an actor! They have not missed a single wedding in our family, except mine. But that was because there was an accident and their brother Hridayanathji and his wife Bharatiji were injured. After two weeks, Ashaji and Lataji came and gave me presents. One festival that our families never miss is Diwali. The tradition started in 1960-1961 and continues today. We never miss exchanging clothes on Diwali day. Whenever they have a function, they invite me. When Rahman did a concert for the Dinanath Mangeshkar Trust in Pune, I was with them. I always call them on their birthdays and wish them. I remember attending Lataji's 75th birthday function. This year, she will be 80. I will be there and have food with her on that day. We hope she continues singing for a long, long time. I wish her a glorious 80th birthday. Varun can't stop lifting Alia!